This topic has 314 replies, 26 voices, and was last updated 7 months ago by cjr61. From a quick glance the frame has some scratches but nothing serious. The list of components that are various shades of rust include: cassette, front mech, chain, brakes. The fork when compressed ejected sticky water out the preload cap. The rear brake sticks on and needs to released by pulling it back again. It would have been nice to have some bits to sell, but to be honest for £40 I’m not upset if everything goes in the bin. Before I got out the tools I weighed it: the complete bike weighs 13.7kg, 5kg of that being the wheels. Interested in this, I have a carerra blast in bits in the garage. I’m wanting regular updates rossburton! Daughter’s Commencal Normal project is down to the frame. Everything else worn, stuck or too heavy. It’s the most expensive second hand frame in history. Good job generous folk off here have helped with the new bits! state of that lawn. good luck with the bike! For some reason someone at Halfords thought it would be funny to use T30 bolts to attach the callipers. The cranks were attached to the square taper axle using a 15mm bolt which all my books suggest was antiquated a decade ago and my socket set only went up to 14mm. Finally got everything off apart from one crank for which the thread the puller screws into was pretty comprehensively destroyed. Ended up taking it down to my LBS in the morning, who phoned back that afternoon proudly telling me they’d got it off: they had to file the sheared threads to get a puller in, then discovered that the bottom bracket had fallen apart so the tool to remove that wouldn’t work either. An hour and six tools later, they won! Also got a new cartridge headset installed at the same time (old one, of course, fell apart during the strip down and the shells were corroded). Now the frame has been stripped we can weigh it: 1.78kg with a headset. 2.5kg a wheel seemed rather excessive, removing the tyres and tubes (apparently made of a black flexible form of lead), rotors (looks and rusts like steel, but also a lead-iron alloy), and cassette (some rust but a serviceable 7 speed) bought the scales down to 0.9kg (front) and 1.1kg (rear). That’s not too shabby and considering the only feasible upgrade involves Stans Crest 24″ rims (£70 each!) I think I’m going to try wrapping less than a kg of gorilla tape around them to see if they’ll go up tubeless. That lawn has the strangest grass: leave it and it goes an amazing even green but then gets straggly, cut it and you discover that it was only the top inch that was green and the rest looks dead. Walking on it is like walking on a 50 tog duvet though! Saddle clearly too large for an 8yo bottom. Replacing. Seatpost passable. Would like a lighter one but not high on the priority list. Seat clamp: the bolt is a little rusted but this is a QR clamp that still works. Unless someone has a purple anodised one for the right price, keeping. Shifters: clearly had water in, seen better days. Currently 3×7 but I’m going 1x and my son wants a trigger not grip shift, so replacing. Brake levers: mechanical, bit too big for little hands to be honest. Bars: more iron-lead alloy. Replacing. Stem: wrong shape, huge. Replacing. Forks: heavy coil RST Capa forks. Replacing. Cranks: until I discovered a shorn thread I would have converted this from triple to single, but needs replacing now. Front mech: literally a piece of rust that started to disintegrate as we took it off. Redundant. Rear mech: buried under all the grease and grime might be a usable mech, will leave in something to clean it with. Brake calipers: unlike the newer Blasts which have reasonable brakes, these look rather “industrial”. Replacing. Pedals: not pimp, pedals should be pimp. My son wants purple ones. Wheels: a bit weathered but the hubs and freewheel seem fine. Will attempt to run tubeless to keep the weight down. Rotors: I genuinely can’t believe how heavy these are, and they’re rusted. Replacing. Post of the day for me. New rotors for my susser (STW), so the Blast can have the ones on that now. I’m probably going to get a 9-speed Sora rear mech which can take 11-32 cassettes, and a 7-speed Altus trigger shifter. This means in the future if the wheels get upgraded I can jump to 9 speed just by changing the shifter. First I’ll clean the old one though. Bottom bracket will be ordered once the cranks have arrived. A little unsure about square taper: they come in all different axle sizes so should I just go for the narrowest as 8yos have narrow hips? Hopefully Sunday will be Start Building The Bike day with my son, so should have some more photos tomorrow evening! 118mm for that suntour crank. Un54 About £13 or you can get a tange-seiki unit that’s about 215g off eBay for 27. I found that the thing is to enjoy the building and the end product, and not worry about the cost when you discover all the things that need replacing. 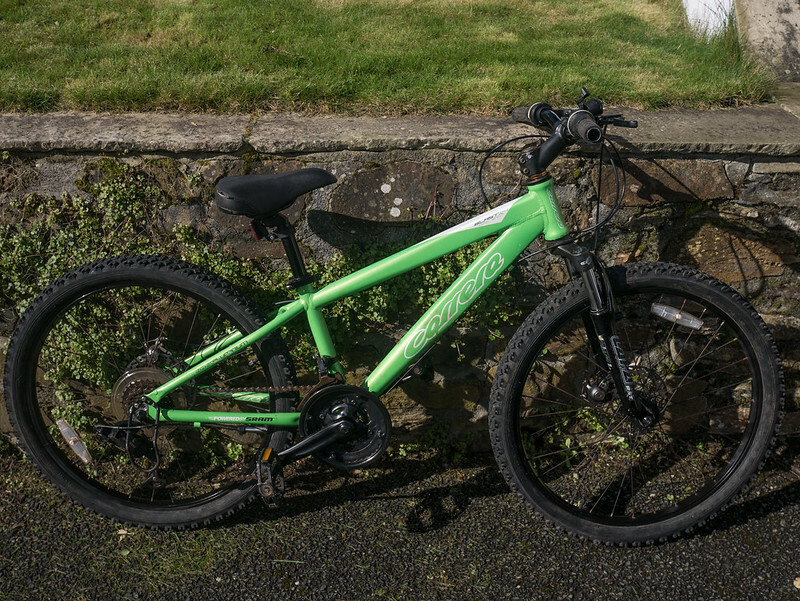 Hoping to get a thread/pic of my daughter’s new bike up when it’s back from the LBS later in the week. Took it in to get some Deore brakes sorted “We’ve got a pair of SLX been on the shelf too long, we can do them for the same price….” Would have been rude not to. I made this mistake with my daughter’s hotrock, went too narrow and put the chainline too far inboard, bottom sprocket (11t) derails the chain from the chainring. That reminds me, our frame still has half a bearing shell welded into it, I am inspired to attack it again today. Are you going for a frame respray? Is that from experience, or does the crankset have that written on somewhere when I get it? UN54 appears discontinued, UN55 is 15 quid on CRC though. Looks like a winner. 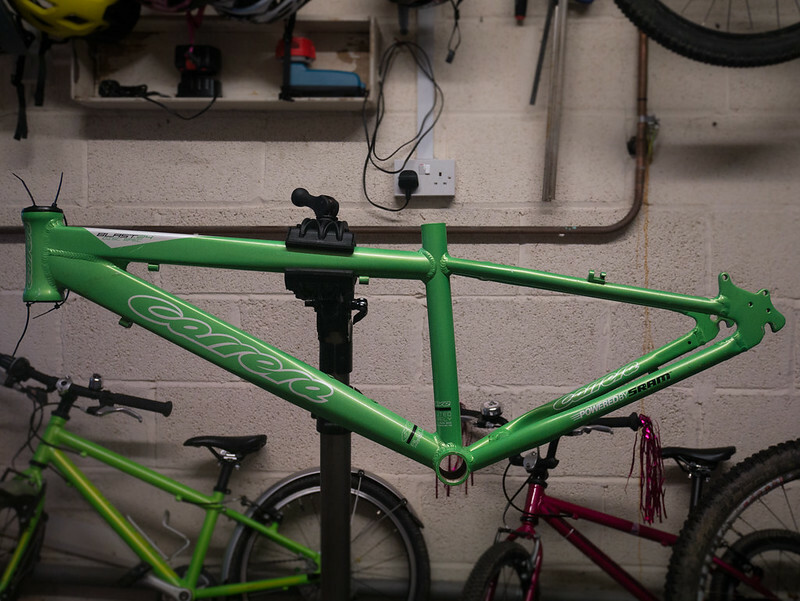 I was considering it but my son (and my daughter who is set to inherit my son’s current bike) are quite keen to get the build going, so we can leave it for now. Maybe next winter. Green is the colour he wants anyway so we’d just be neatening it up. halfords sell VP sealed BB’s for 9.99. Will have 118s in stock in 99% stores. 118mm is the standard size for the blast running a triple. Can’t see mention of the front mech replacement – just rummaged and can stick a 34.9 LX in the post, if of any use. Damnit the 9 quid one has the wrong shell size. 30 quid seems a bit keen. s that from experience, or does the crankset have that written on somewhere when I get it? What I fitted on Lewis’s old blast before I sold it as I took the thorn crank off. Okay does anyone know if there exists a bottom bracket cable routing guide that takes an outer? I put 24″ rocket Ron’s on my lads Blast rebuild, and they seem pretty good. Worked well in Les Gets and Samoens last summer, and fine in local mud. I went straight for 1×10 set up with an XT 11-36 cassette and a 42t expander ring, Slx rear mech and deore shifter. Narrow wide superstar chainring but added a bash guard so his school trousers didn’t get caught in the chain!! I was trying to find a 32t-ish bash guard (I’m going 32t single chainring) but the only one I could find was the Hope one. As great as they are, that’s a bit excessive… All the cheap plastic ones are 40t-ish which is a bit huge really. Yeah the Hope on is pricey but I just happened to have one laying around so used that. I was torn over 32t vs 30, looking at other similar bikes shows a huge range of options. Worst case that’s a quick swap. For all you guys building your kids bikes I am putting in the classifieds my sons SRAM 150mm cranks. Judging by the interest in this thread you might have a bidding war! I’ve a 113mm UN54 you can have. It’s used but buttery smooth. I’ve also a RF bash guard, came off my 5, was running a double, I think it was a 36t. Did some more buying today: got a new Sora mech off eBay for six quid, and an Altus shifter from a proper shop. Still need grips. I really like the look of the Spank Grom grips – thin and narrow to suit small hands, but black with green are basically impossible to find in this country. I’m a little tempted to go with bar tape, anyone else tried this? All I need now is to get the crown installed on the fork… LBS trip tomorrow. I replaced the bb on my 5yo daughters bike (a scott contessa) and was surprised to see it was specced wide, 120 something. Don’t know if this down to the bike / chainline or if there’s a biomechanical reason for it. Bought a 32t bash ring from here which should look good on the cranks when they eventually arrive. After discovering that the new crown race is not split and a very tight fit, decided that I didn’t want to hit my new carbon forks with a big hammer and took it down to the LBS. Spent the rest of my lunch with a 6mm drill and drilled out the cable guides so I can go full outer for the gear and route the hydraulic brake cable. Hopefully my Wilko special round file managed to get the big lumps off! Got the Rocket Rons here as well in 24″; have gone up,tubeless, although the sidewalks took a fair bit of sealing, and seem to grip well enough. Light too. Hopefully I’ll report back on how my Halfords rims + gorrilla tape + Rocket Rons go up over the weekend! After dinner we went to the garage and did the first bit of spannering: fork, stem, and bars on. It was decided that the seat is the most important piece of the bike so that also went on, although you’ll notice that I was terrible at eyeballing the seat tube angle. Need to find a cheap/light seatpost I can cut down to replace the stock one. Brakes arrived today so they’ll be going on next, but with comedy long hoses until my cutting tools arrive. Also never doing bike build stuff with the kids at 6pm, they’re far too hyper/tired to focus! Be interested to see how you get on going tubeless. Thinking of giving it a go on my lads blast.